1. Nestle plans for the future: Nestle (NSRGF) says it's exploring the sale of its skin health business. The company's board said in a statement that "future growth opportunities of Nestle Skin Health lie increasingly outside the group's strategic scope." The move could put the spotlight on Nestle's future plans for its stake in L'Oreal (LRLCF). The board has been under pressure from activist investors, including hedge fund billionaire Daniel Loeb, to ditch the cosmetic giant. 2. Jack Ma's warning: Alibaba's Jack Ma says the escalating trade conflict between the United States and China has undermined his earlier promise to create 1 million new US jobs. "This promise was on the basis of friendly China-US cooperation and reasonable bilateral trade relations, but the current situation has already destroyed that basis," Ma told China's official news agency, Xinhua. "This promise can't be completed." 3. Brexit tension: The first day of an informal gathering of EU leaders in Salzburg failed to yield a breakthrough on Brexit. Britain and the European Union have not yet been able to agree the terms of Britain's impending exit from the European Union, raising fears among businesses that the country could crash out of the bloc without a deal in March 2019. Analysts will be watching for news out of the summit on Thursday. European markets were opened higher. Asian markets ended the session mixed. 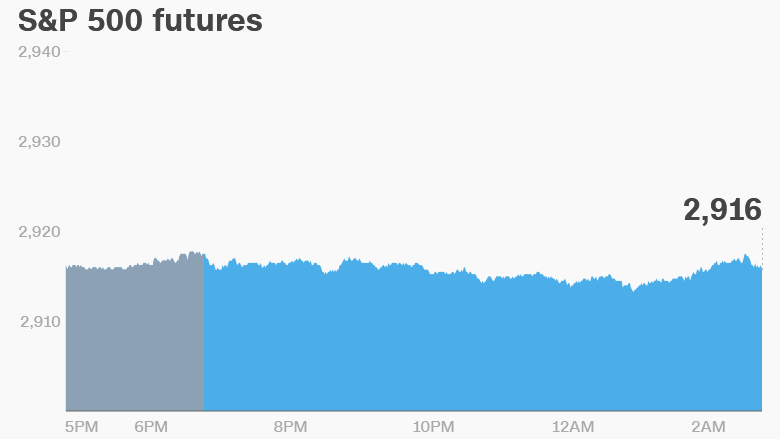 The Dow Jones industrial average closed 0.6% higher on Wednesday, while the S&P 500 added 0.1% and the Nasdaq shed 0.1%. 5. Earnings and economics: Darden Restaurants (DRI) will release earnings before the US open. Micron (MU) will follow after the close. Aston Martin is targeting a price of £17.50 ($23.08) to £22.50 ($29.68) per share for its IPO, giving the luxury carmaker an implied value of up to £5.1 billion ($6.7 billion). Some analysts aren't so sure. "We love the brand. We respect the management team. But we simply can't see how a Ferrari multiple looks realistic," wrote analysts at Bernstein. Shares in Canadian cannabis company Tilray (TLRY) jumped 38% on Wednesday, hitting a market cap of $20 billion. Marihuana will become legal in Canada next month and the stunning rise in the share price is partially fueled by retail investors hoping to cash in. Equifax (EFX) has been fined £500,000 fine ($659,000) by the UK Information Commissioner's Office. The regulator said the credit scoring company failed to protect the personal information of up to 15 million UK citizens during a cyberattack in 2017.